Having a durable bowl for your pets food and water is so important. How many of our readers have pets? Dogs? Cats? Another kind of fun pet? As you know, we have tons of wonderful pets and of course they all have their favorite bowl to enjoy their favorite meal. We are giving away Robusto Bowls Durable Pet Feeding Dishes to a lucky fan. Giveaway is hosted by The Parenting Patch and sponsored by Loving Pets. Nearly indestructible and built for extreme durability, Robusto Bowls offer the beauty of ceramic without the shortcomings. The pet bowls feature solid, heavy gauge aluminum construction paired with simple designs on brightly colored ceramic-like, bacteria resistant interiors. Learn more from the Robusto Bowls Durable Pet Feeding Dishes Review from The Parenting Patch. One lucky reader will win one (1) Robusto Bowl. To enter for your chance to win the Robusto Bowls Durable Pet Feeding Dishes Giveaway, simply use the following Rafflecopter form. Giveaway ends June 15, 2014 at 11:59 pm CST and is open to US only. Good luck! The Robusto Bowls Durable Pet Feeding Dishes Giveaway is open to legal residents of the United States of America. 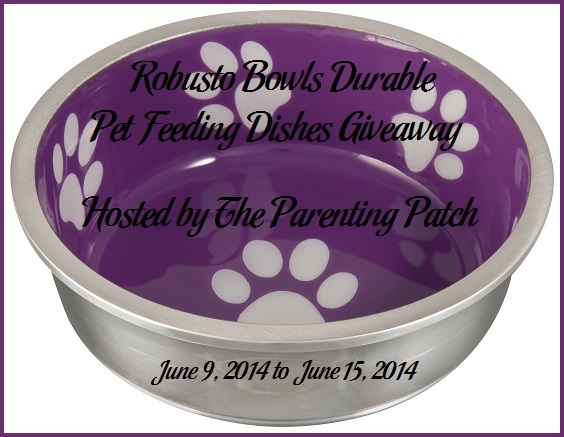 The Robusto Bowls Durable Pet Feeding Dishes Giveaway ends at 11:59 PM CST on June 15, 2014. One winner will be chosen at random via Rafflecopter. The winner will be sent an email and will have forty-eight hours to respond. If no response is received within forty-eight hours, another winner will be chosen. The Parenting Patch and Giveaway Bandit are not responsible for prize fulfillment.